USB has literally become universal and present in every device ranging from smart phones and personal computers, IoT and wearables, storage and networking, consumer electronics and gaming consoles, automotive and many other emerging verticals. The success of USB can be attributed to innovation with each new generation—the capability to transfer data as well as supply power for charging devices and ease-of-use with a variety of connectors and form factors. USB Implementers Forum (USB-IF) recently announced the publication of the USB 3.2 specification, while Synopsys just announced the availability of the industry’s first VIP and UVM source code Test Suite for USB 3.2. Two-lane operation using existing USB Type-C cables. Continued use of existing SuperSpeed USB physical layer data rates and encoding techniques. Minor update to hub specification to address increased performance and assure seamless transitions between single and two-lane operation. USB has been one of the primary protocols driving the digital revolution over the years. It started with requiring universal replacement of a variety of serial and parallel ports to connect peripherals in the mid-90’s, and was whole heartedly adopted by PC manufactures. USB then became the popular interface for flash based storage devices. The speed and power supply was increased multifold, driving ubiquitous use of USB. The USB Power Delivery (PD) specification took power supply to the next level by delivering power ranging from 60W (3A @ 20V) to 100W (5A @ 20C) over varied cable profiles from Type-C unmarked cables to Type-C electronically marked cables. In mid-2014, the USB Type-C standard was announced, which provided the thinner, reversible connector and ever evolving ecosystem of new platforms like MHL, DisplayPort, HDMI, and Thunderbolt over Type-C. Continuing the innovation, USB 3.2 further enhances the USB capabilities with support for multi-lane solutions. The UVM source code Test Suite provides an easy to integrate testbench and comprehensive set of tests. The testbench for a host DUT connected to a device VIP provides a host driver to translate data objects to DUT specific API sequences. There is also an xHCI driver for generic xHCI register model and memory operations. For example, to create a command TRB and write it to a command ring, ring the command doorbell and watch the command completion event TRB. The testbench for a device DUT connected to a host VIP provides a device driver to translate data objects to DUT specific API sequences. Synopsys USB verification solutions are being adopted rapidly and in production by many customers. Read more about Adoption of Synopsys USB Type-C Subsystem Verification Solution by ASIX. 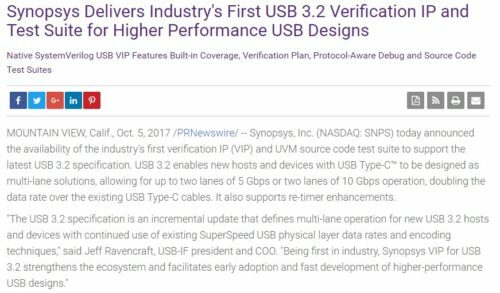 For more information on Synopsys VIP for USB and verification subsystem solution for USB Type-C, please visit: www.synopsys.com/vip. This post is filed under Automotive, Data Center, Display, Flash, Mobile SoC, Storage, Type C, Uncategorized.